Most commentary and analysis coming out of Brazil appears to depict the Latin American giant in the middle of a great storm. It is almost impossible to foresee how the storm will end and what losses are likely to be incurred. But this is not Brazil’s current situation. In fact, Brazil is going through a great new churning which can only jolt the country into moving forward. Re-elected President Dilma Rousseff has admitted she made some policy mistakes in order to try to save jobs and workers’ real wages. Her economic policy was (mis)guided to stimulate the economy by fiscal expansion and credit incentives. One could argue that these policies were overdone. However, it’s a stretch of the imagination to believe that Brazil is in any political and institutional disarray. Any ‘impartial’ analysis of the current sutuation in Brazil cannot ignore the country’s resilience: Brazil is a thriving democracy, which possesses an independent federal police, a free-standing judiciary, and a critical free press. Increasing political independence of the majority of Brazil’s members of Congress is a case in point and reveals how far Latin America’s largest democracy has come. A further testament to this is that the PMDB (Brazilian Democratic Movement) is now the largest Brazilian political party and holds the leadership of both houses of Congress. This is not a political accident, but rather the party’s strategy to win the Brazilian presidency in the 2018 election. Brazil’s first civilian president after a 20-year military dictatorship, José Sarney, was a member of the PMDB. Since then, however, the party has never had its own president, preferring to team up with other parties. 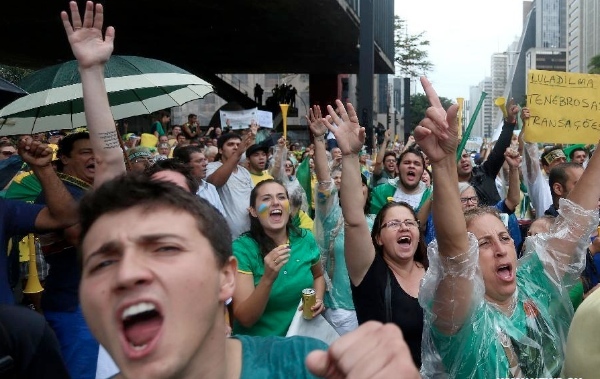 The recent protests and disenchantment with the government’s performance have shown that there is still a long way to go for Brazilian democracy to achieve full maturity; tough tests lie ahead. Political reforms must come first and foremost. These should include a national congressional and local district-based ballot system in which the politician who gets the most votes and maintains ‘party loyalty’ will become a member of Congress. The Rousseff administration must also urgently pay heed to fiscal adjustments and reforms which will reduce both the size of government and taxes. The third and critical stage will be how Brazil´s judiciary creates legal mechanisms that foster zero tolerance for corruption in public institutions, such as the currently embattled state oil giant Petrobras. Simply put, Brazil is facing a challenging time ahead. But in spite of all the warnings of ratings downgrade, there is an undeniable institutional maturity inherent in Brazil. How else can one explain these well-coordinated protests? Social demands are being elucidated, with a lot of passion as is evident from the chants of the protestors on streets, and will hopefully lead to constructive political debate to find a way out of the present political, social and economic storms. The high-decibel March 15 protests – widely covered by international media – highlighted the four core issues that Brazilian society have identified as impediments to security and stability: Skyrocketing corruption in the public sector, lack of political reforms, high inflation and slowing growth. Corruption in the Brazilian public sector has been endemic. The well-known Petrobras scandal might just be the largest public bribery scheme estimated at $2 billion. The graft scheme was achieved by company officials by overpricing Petrobras contracts with some of the biggest Brazilian real estate developers. The money was then partially used to finance political campaigns, but most was directed to a few of the company´s directors. This type of bribery has occurred for years in Brazil. But a significant point to be made here is that the present crisis also reveals the Brazilian judicial authority’s new-found empowerment. It also highlights that the federal police department is independent to investigate, judge, and incarcerate those involved in corruption. Needless to say, the stellar role of the Brazilian press to bring these issues to public knowledge has become critical to institutional stability. 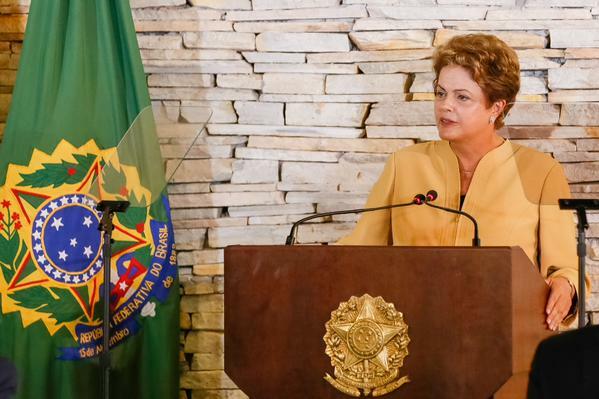 Brazil’s executive branch has already sent the Congress a new law against corruption. When Brazilian Vice President Michel Temer summarized the aim of the recent social demonstrations as “The Brazilians demand democracy of efficiency” – he was commenting on a crucial national institutional turnaround. Months into her second term, Rousseff is facing calls to resign – this, indeed, is a storm. However, most of the public ire, one believes, emanates from slowing growth and projections (and perceptions) about drying foreign investment. Brazil’s new Finance Minister Joaquim Levy, in an essential warning, has said the country´s growth will now rely more on capital markets and foreign investors and less on federal government financial support, stable and competitive exchange rates, and lower real cost of production. The 8.5 per cent inflation rate, and 12.75 per cent central bank prime rate is to be reduced by more than 3.5 percentage points by the end of 2016. The Brazilian Development Bank (BNDES) will not change its purpose to stimulate growth and productivity; however, it will have to count on fewer subsidized resources from the Brazilian Treasury and more on financial resources from the capital markets. In 2013, the treasury accounted for more than half of BNDES’s funding. The recent fiscal adjustments announced by Levy could lead to vital reforms. First, the revision of a spectrum of fiscal expenditures, which eliminate excess and waste in allocative policies and development programs, have been accomplished. Congress and the Federal Government are currently engaged in a political compromise to ease fiscal adjustments and ascertain financially feasible unemployment benefits, death pension rules, and health care. They are also looking to reestablish taxation – which were reduced during Rousseff’s first mandate – on the revenues of firms. According to the path of fiscal reforms, this should create a strong foundation for the country´s decrease in interest rates and the cost of production. All these measures – large investments in infrastructure, reduction of the cost of capital and the cost of production – are nevertheless insufficient to increase Brazil’s competitiveness. Educational programs will need to designed in tandem with the private sector´s demand for more efficient workers and managers, flanked by world-class technology and innovation. That, in turn, will require ease of doing business – easier ways of opening and closing business firms. Notwithstanding all the wrangling, it all starts from where we began: fiscal and monetary growth responsibility. It will take two more years for the Brazilian government in conjunction with members of Congress to pave the road for growth, lower inflation, and an increase in the rate of investment from the actual 20 per cent to 24 per cent of GDP by the end of this decade. With its strong institutional foundations, Brazil must find its own legitimate solutions and its own way out of the storm. Ernesto Lozardo is Professor of Economics at Fundação Getulio Vargas (FGV) in São Paulo. He is also an advisor to the Brazilian National Development Bank (BNDES). Economist from Columbia University, and former Planning and Economics Secretary of the Sao Paulo State. His last book was "Globalization: an unpredictable certainty of nations" (in Portuguese), 2008.